In Uccle, the transit will start at 13:12:19 Local Time, closest distance to the solar disk centre is at 16:56:13 LT, and Mercury's tiny silhouette will have entirely left the solar disk at 20:40:33 LT. It is possible that clouds may obstruct the view of the Sun. Indeed, solar telescopes cannot see through the clouds. Clouds do not let pass white light and the blue and red parts of the visible solar spectrum. 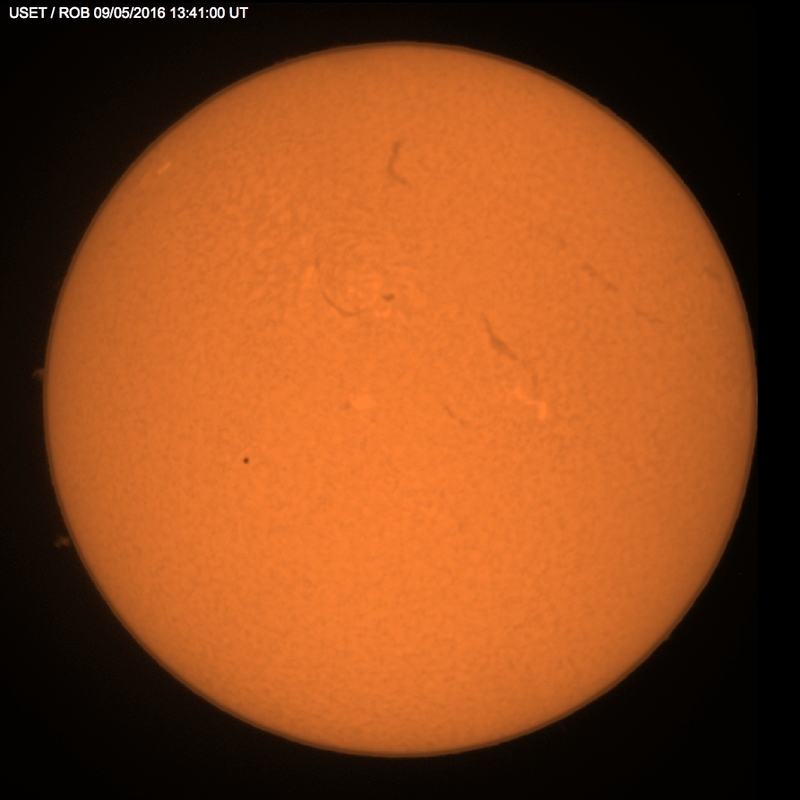 The images above are taken by the USET telescopes in white light (the 'solar surface'), in blue light (Calcium IIK, 393.3nm), and in red light (Hydrogen-alpha, 656.3nm) of the solar spectrum. The latter two show the inner atmosphere of the Sun at resp. about 1000 and 1500 km above the solar surface. In Uccle, the transit will start at 13:12:19 Local Time, closest distance to the solar disk centre is at 16:56:13 LT, and Mercury's tiny silhouette will have entirely left the solar disk at 20:40:33 LT. In Uccle, the closest distance between the two disk centres will be 321 arc seconds, or about 1/6 of the solar disk. 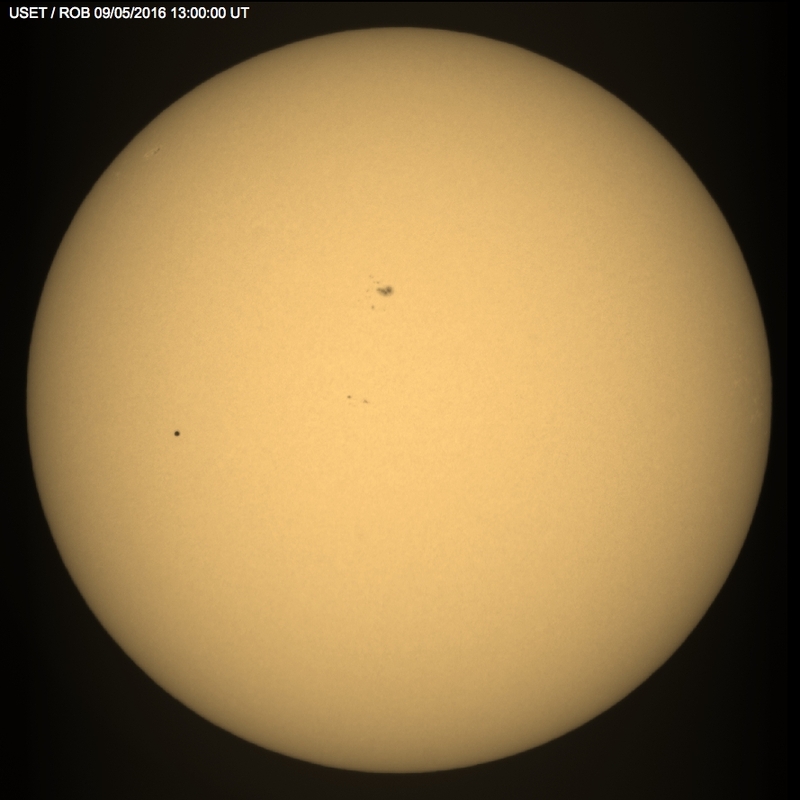 In H-alpha and Ca IIK, the transit may start slightly sooner and ends slightly later, as Mercury's disk will cover higher parts of the solar atmosphere. The sketch underneath (from 12 April!) shows what may be visible in these 3 passbands. Mercury's tiny silhouette will always be extremely sharp, dark and very symmetric, due to the planet not possessing an atmosphere and having a round shape. This outlook distinguishes it from sunspots, which are usually somewhat irregular in shape and emit some light. Sunspots look darkish because they are about 1000 to 1500 degrees cooler than the surrounding solar surface. 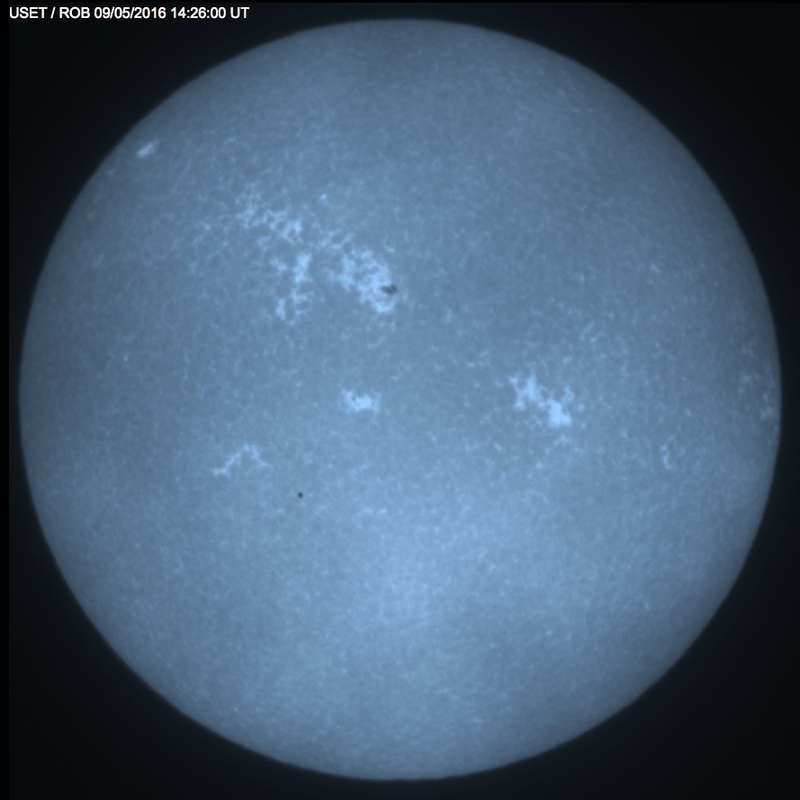 The biggest sunspots are also visible in H-alpha and Ca IIK, but the smallest are best visible in white light. In H-alpha, there may be some elongated grayish structures visble. These are called filaments and denote the borderline between areas of opposite magnetic fields. In Ca IIK, bright areas may be visible which are called "plages". These may also be visible in H-alpha, and also in white light when they are at the limb. In Ca IIK and H-alpha, sudden increases in brightness on the solar surface may indicate a solar flare.